Announcing David Baar to join the Advisory Board of Moore & Gasperecz Global, Inc.
We are very pleased to announce the addition of David Baar to the Advisory Board of Moore & Gasperecz Global Inc. “David has deep technical experience but also patent experience. 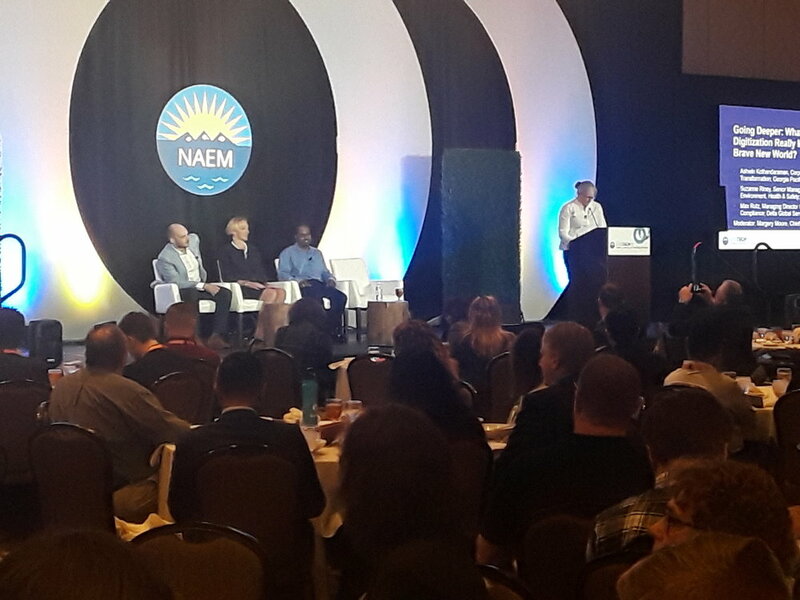 With a patent pending, and more to go, we are very excited to have such high caliber assistance from David,” said Margery Moore, CEO, Moore & Gasperecz Global Inc.
Moore and Gasperecz Global Inc. launched the beta version of ehsAI at the NAEM Tech19 Conference in New Orleans last week. The response was overwhelming! Paul Barter is an innovation, entrepreneurship and research executive with over 30 years of experience in the technology product and services sector, with firms from global multinationals to entrepreneurial start-ups. There was a packed house of over 250 EHS professionals in the room to listen to Delta Ground Services, Boeing and Georgia-Pacific discuss their strategies for the adoption of digital transformation tools. Each one had interesting stories and lessons to share as they journey along the innovation curve. This conference provides attendees with peer-to-peer learning and advice to help leverage technology and trends to advance EHS&S performance. Moore and Gasperecz Global have a booth and are presenting with their first customer, Red Cedar Gathering, on March 14th. A recognized leader within the EHS community, she has held positions spanning across Fortune 100 companies, including General Electric (GE), Tyco International, UTC, and ABB/Combustion Engineering. In her role as the global environmental leader for GE, Kris was responsible for the strategic direction and implementation for several programs and sustainability initiatives across the company. We are pleased to announce that Moore & Gasperecz Global Inc. are a top-tier Terabyte sponsor at the EHSTech2019 conference in New Orleans from March 12-14th. The team will be showcasing ehsAI in a customer presentation and in the exhibit hall. Margery Moore of Moore & Gasperecz Global Inc. has been invited to join the Biomimicry Institute‘s Advisory Council on Artificial Intelligence (AI) for the Asknature.org initiative. The team at ehsAI is very pleased to be invited to present at the Enviance User Conference, in Denver on September 10-12th. We are very happy to announce the official launch of the Alpha version of ehsAI, an on-demand Environment, Health & Safety ( EHS) solution that will automate the interpretation of complex legal documents, like permits and regulations.